My first real sleeping bag was Army surplus, filled with feathers and down (more feathers than down it seemed) with some kind of cotton/poplin shell, stuffed fairly small but weighed like 8 pounds. But for $20 it was a vast improvement over the cotton flannel Sears bags we had. Sleeping bags are always the most expensive piece of equipment to buy and hopefully they will last a long time, mine have. I now lend out the old bags to people who haven’t bought a good one yet. 0. Army surplus feathers and down mummy bag ’70-’72, ~120oz. 1. Camp 7 North Col, 600? fill goose down, -5 degree, ’72-’04, 55.5 oz. 3. Moonstone Polarguard 3D, 15 degree bag, ’00-’04, 54.5 oz. Camp 7 was the state of the art in the early 70’s and the Arete (#2) fit inside the North Col (#1) for those real subzero winter trips. Mostly I used them separately depending on the season. At some point I must have fallen for the conventional wisdom that you needed a synthetic bag for wet conditions and got the Moonstone (#3) it was fine but heavy. In reality I have never had a bag get wet on a trip, down or not. Finally after years of lusting after a lighter bag, and a Western Mountaineering one at that, I got weak after a Big Bend trip and bought the Ultralite (#4) in Austin at Whole Earth Provision, worth every penny! Impeccably made and warmer than advertised (I have had it down to 6 degrees and many nights in the teens). The Ultralite is a narrow bag but I am used to that from using the Arete for years. The latest bag in the quiver is a 35 degree Western Mountaineering Highlite (17.9 oz.) for the desert trips and the odd summer trips in the East. I have only used it on a few trips with temps as low as the 20’s but mostly in the 30’s and it was perfect. I did sleep in it out in the open, no bivy, down to 20 degrees with a down vest and all my clothes on and did just fine but had to work at staying warm some. 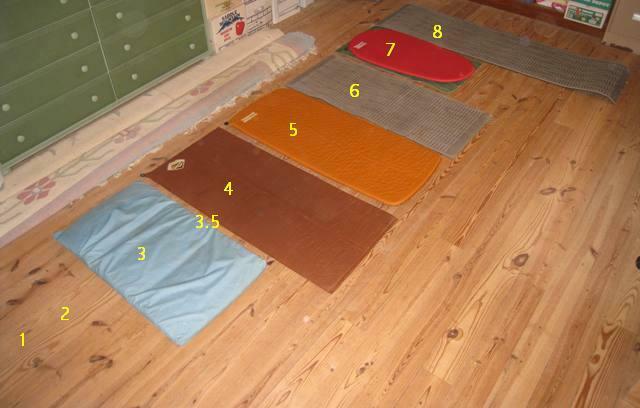 Sleeping pads have undergone lots of changes over the years. Part of it is new technology, part is the search for more comfort as we get older. Of course at first we were young and tough and didn’t need any pad. Then for insulation when cold I used a section of an old wool Army blanket. The first foam pad was open celled and really not much padding or insulation but it seemed the thing to do. The ensolite was a break through in both insulation and non-squishable padding. Finally inflatables arrived and they just kept getting lighter so I had to get new ones. 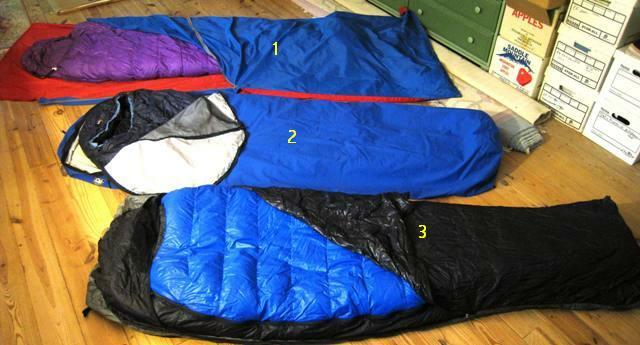 Like the sleeping bags these older models are popular lending items. The final piece of the sleep system puzzle is a bivy bag and I have used one for years, because while I own a few tents, I almost never carry them but use a tarp or nothing instead. I like them for wind, dew, rain spray and keeping the bag clean. I almost never carry one in the desert. Condensation is the biggest issue with a bivy and my thoughts on how to deal with it are here. No pictures of tents (hard to set them up in the office) and like I said, not much of a tent guy. Here is the list just for continuity. For many years the tarp I used was the rain fly from the 1972 North Face Mountain tent and I use my walking poles for the set up. In 2017 I finally broke down and bought a Gossamer Gear Twinn Tarp to save 7 ounces. This entry was posted in Equipment and tagged bivys, pads, sleeping bags, tents. Bookmark the permalink. I just bought a Camp 7 Timberline of Craig’s List. It’s a Chinese made Sport Chalet bag I assume. It has 32oz of fill and is a semi mummy shape with very little taper. It appears to be made pretty well and was never used. I got the original sack too. I paid $45. I’m guessing it’s good to 5-10 degrees. I know it’s not an original but did I get a decent bag at a decent price? Eric, I am not familiar with the Timberline model, it is definitely after the time Camp 7 was still in Colorado. But if it is semi-rectangular with 32 oz. of fill I would guess more like 15 degrees. You got a good bag at a great price. 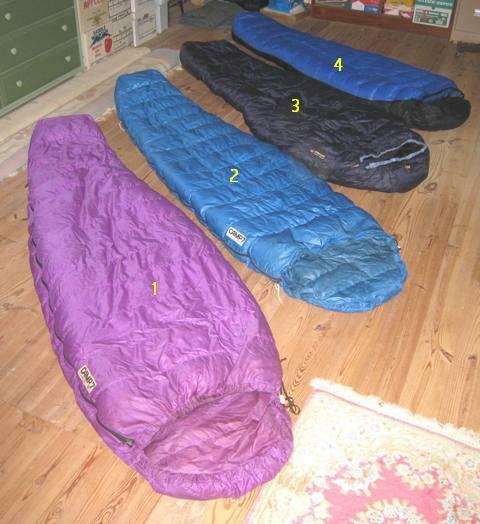 You seem to know a lot about the different model of Camp 7 sleeping bags. I just purchased a 40oz purple camp 7 goose down sleeping bag. There is no model name of it. 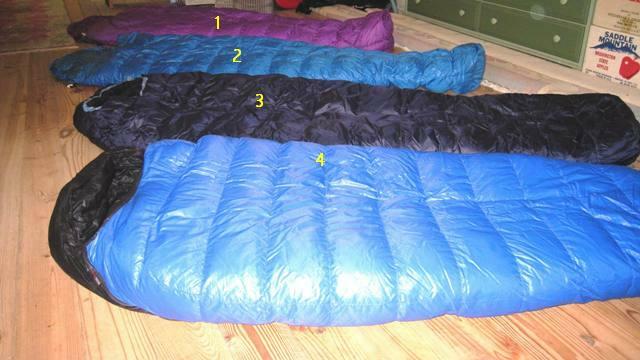 Do you happen to recognize a purple 40oz goose down sleeping bag made by camp 7? I am hardly an expert on Camp 7, but the only purple one that I know of is the North Col. The large size was originally spec’ed at 40 oz. and had 7.5″ off loft. It is the one in the pictures in my sleeping bags post. Thank you so much for responding to my post. Do you happen to know what the temp. 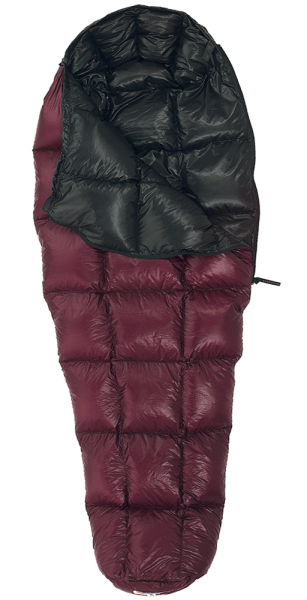 rating was on this 7.5″ loft North Col. sleeping bag. 7.5 inches seems like a fairly large loft. Is 40 ounces a lot of down? i recently purchased a camp 7 bag, it is gray on the outside and purple on the inside no other tags to serial no is 204051 any idea what it is? Wish I could help, my only reference is an early /mid 70’s hang tag and they do not have one that was gray outside. My serial numbers are in the 7 digits while yours is 8 so it could be after Camp 7 was sold. I notice under the pictures, your North Col. was 55.5 ounces and was -5 degrees. Since it is almost a pound more in down, it seems like my North Col would not be a -5 degree bag. I mis-typed originally. I am working off a old hang tag from Camp 7. The North Col was spec’d at 31 oz. of down and 56 oz. total for the size large. A measurement of 7.5″ of loft would give you -5 degrees in the old ways of estimating warmth. On the hang tag they also give the colors of the different models and they only purple one is the North Col (at least at the time). They certainly could have used other colors at other times. The only bag they had that was spec’d at 40 oz. total was a blue Arete in size large, which was a 25 degree bag, which is also pictured in the above pictures. Can you tell me if orange was mentioned on the north col tag. I also have two orange bags. one I bought myself when I was 18 or 19 years old. At the time, I remember the guy who was helping me at the great pacific ironworks (pre Patagonia name)yard sale said the bag was a -25 degree bag. They were selling off extra stock and this bag was one of their extras. Recently, I answered a craigslist add for another -25 degree camp 7 in orange. The man who sold it to me (original owner) was in his early 60s and he was an engineer for government. Not the kind of guy who would get numbers wrong , and since it matched what I believe I remembered about my first orange bag, I am assuming -25 is correct. Do you happen to know anything about this bag? Through some research, I found that lighter bags were part of a cold weather bag system. The lighter down bag was to be put in an outer synthetic bag for extra cold weather use. The Arete was meant for use this way. It did not catch on. Do you know anything about any of this. I would be interested in knowing what the actual name of this orange bag was or if there were a bunch of different weights for the north col.
Hey, nice gear collection. Mine would be similar but my wife and I had all our gear stolen a couple years ago, and have been rebuilding. Today I picked up a Camp 7 down bag at an estate sale, Its hardly used, has the Boulder logo, and loft wise is comparable to my old 0 degree North Face bag. I’d guess its rating would be between 0-15 degrees. It is awesome and a similar color blue as the one you have pictured but much greater loft. They had a blue model called Camp 7 that was rated to 0 degrees with 7″ of loft, that is probably what you have. Thanks for all the info! The bag itself has no labelling except the Camp 7 Boulder Colorado tag next to the zipper. inside it says LG 6,6 Lt zp which is the length and zipper orientation. Do you know if Camp 7 was bought out by another company later, like Sierra Designs. The colors remind me of early Sierra Designs bags, which is the bag company Ive used mainly since 1987. My understanding is the designs were sold to Sport Chalet in California in the late 70’s, what happened after that I don’t know. Like others, I just came into possession of a Camp 7 sleeping bag – given to me from my grandfather. The tag reads “Yosemite” style, 31 oz of fill. It’s made in China, but “imported by Camp 7.” It’s a little heavier than I’d like on the trail, but it’s in great condition and I’d like to use it for car camping. My grandfather said its a 20 degree bag. Are you familiar with this model? If so, can you confirm the degree? Joey, my limited info on Camp 7 bags does not include that style. I sounds like a later production after Camp 7 was sold. wish I could help but that one is a mystery to me. I still have my Camp 7 Arete from the 70s (I used to sell them back in the day). I just weighed it and it comes in at < 2.5 lbs, but maybe my scale is off. This is a 6'6" model and the loft is in very good shape still (Goose Down). I've always babied it, hand washed it in a tub, tumble dry very low heat. It's interesting that over the years I've used it in warmer weather like a quilt with just my feet in the foot box and the rest unzipped and draped over. Lately I'm revisiting my old gear and will need to replace a lot of it because the old stuff is too heavy and I was considering a quilt bag but heck maybe I'll stick with the Arete for a while. Sounds like we are from the same era and stock. I have only washed my Arete once but have used it a lot. I went with the WM Highlite because it saved be 1.5 pounds and was warmer with the now lower loft of the Arete but it does not take anything away from how good the Arete was for a bag made in the 70’s.